Brad Meltzer, the award-winning New York Times bestselling author of suspense novels for adults such as The Escape Artist, Heroes for My Son, and Heroes for My Daughter has leaned into nonfiction for children. He’s written comics and graphic novels and has a Channel television show: Brad Meltzer’s Lost History. He’s so prolific apparently the man doesn’t need to sleep. His recent series, Ordinary People Change the World, has a very smart, well-intentioned focus on enterprising individuals such as Rosa Parks, Lucille Ball, Jackie Robinson, Amelia Earhardt, George Washington. You get it: a who’s who of worthwhile lives, all illustrated by Christopher Eliopolous, himself a very accomplished artist who worked for Marvel Comics and is the author artist of graphic novels such as Cosmic Commandos and Monster Mayhem. These two are on a roll with many titles in the series. There is a clear and understandable, admirable intent for these books to interest the five to eight crowd in nonfiction; it has the allure of big dreams and accomplishments. Who can fault such an enterprise? Nobody. But holding I Am Sonia Sotomayor is not as satisfying as it could be. The narrative is given over in many different formats and this is part of the problem. Visually, the book is mayhem. Sometimes, there is the classic text on each page. There are also pages with a multiplicity of panels. There is white type on black, always difficult and usually avoided, which runs completely across the page, verboten in graphics. Within the panels there are word bubbles. Some pages bleed. Some are framed. Some illustrations are themselves free form bubbles. Some panels are vertical. There are double page spreads that both have bleeds into the gutter so that the eye simply becomes frazzled. It’s a kitchen sink approach to layout and that’s not the only problem. There are two kinds of typeface, one is caps only. Because of this, not only is the book a challenge to read with any ease, the illustration style—trying to be appealing to its audience is, unfortunately—ugly. 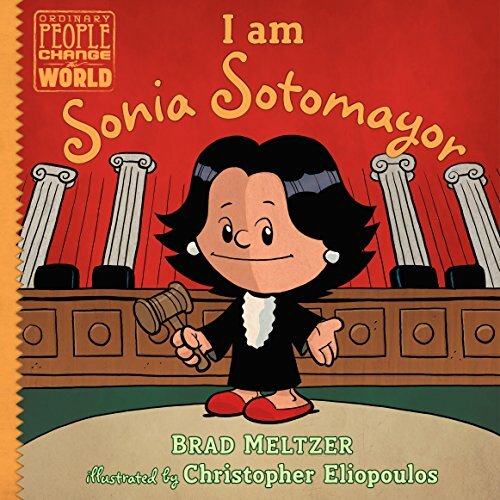 The actual depiction of Sotomayor aligns with animation stats: the character is two heads high—only. So this balloon-headed woman is extremely odd looking. Further, it seems from the earliest ages she was wearing the cloaks of the high court. Sotomayor has an interesting and important story. She went to Princeton, then to Yale Law and was the city’s first Hispanic federal judge. At 55, she was sworn in as the first Hispanic and third female judge on the Supreme Court of the United States. The narrative that a determined Latina could reach such a high level in our government is a wonderful model for children. In the newly published crop of nonfiction narrative there have been stellar and inspiring titles, titles that encourage excellent story telling as well as exposing children to heroes and heroines. These two talented men clearly have so much to offer. Their work has been well-reviewed by many. But reaching higher and sharing an uncluttered, pleasing book is also a worthy goal.